In this day and age, there are innumerable temptations that often lead college students astray. Many people might say that social media, as well as the television, have more negative impacts than good. It is because of these negative things that many college going students take extreme steps, like committing suicide or becoming introverts who cannot even hold a conversation with one another. If you are a college going student, then chances are that you will be looking and seeking for some inspiration to help you along the way. These are few inspirational Ted talks for students which will help to inspire. 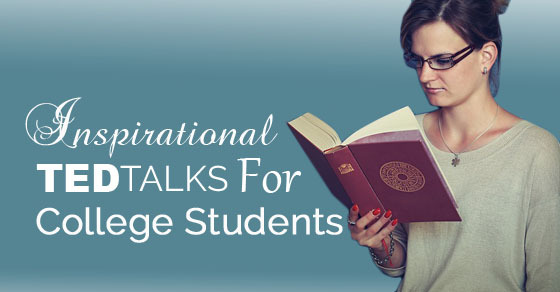 The following mentioned are 15 best Ted talks or motivational speeches for students. Following in the footsteps of the famous philosopher Mr. Morgan Spurlock, Matt Cutts in his top ted talk expounds on how just in a matter of about 30 short days you can change the way in which you live your life. Initially when students enter in to college, they often find difficult to get in sync with the new culture. For them this motivational TED talks will be very helpful as they can use it to mimic or copy as being said and get themselves used to the new culture. After all, as we all know college is a time where we make the best memories. As we grow up and enter into our teenage years we are encouraged sticking to the status quo and agreeing with the natural flow of things, lest we be isolated and deemed as weird in the society. All of us, especially those of us in college harbor dreams of being popular as well as liked by one and all, we try our best to dress and talk in a manner in which we would get people to be attracted to us. However Margaret Heffernan in her inspiring Ted talks encourages students going to college not to passively accept things as they are, but rather to go ahead and challenge the known. It is needless to say that getting into college is no easy task, more over getting into a good college of our choice and as per our financial position is no easy task indeed and is a source of great worry to many students as well as their individual families. In this most inspiring Ted talk, Angela Lee Duckworth talks about exactly this, where she says that now that If you have gotten into your dream college after a lot of sleepless nights you should ensure that you are trying to be the best and stand out so that you make the most of this opportunity which has been given to you. Daring to be different is not something which comes easy to a lot of us. If you are someone who is struggling to be a part of the crowd and are finding it tough to meet friends and get to know people then watching his video might help you a great deal as it depicts a young boy who dares to be different by way of his dance. He is willing to take the plunge as well as throw caution to the wind. In the bargain, rather than running after people, they end up coming to him and he starts a movement of his very own. Have self belief and this could be you. Success is something which all college going students are looking to achieve. Success doesn’t mean earning a lot of money or gaining a lot of fame, but success may mean a lot of different things to a lot of different people. Rather than reading up meaningless things in books or on the internet, it is advisable that you learn about how to be successful from people who have achieved things through hard work and dedication. This popular Ted talk will tell you the simple secrets of success in only eight words and you can carry on these words right through your life. When choosing a career path, college students have to weigh as well as measure a number of different things. Since it is important to realize that this decision is a very important one indeed you should ensure that you think very carefully and make a very informed decision. In this useful, informative and famous Ted talk teaching, Jullien Gordon explores the age old debate of who is better, whether it is the street smarts or the book smarts. In addition to addressing this matter, he also expounds on how you can choose the career path of your choice without talking a huge bank loan upon your head. Not many of us realize that learning is something which not only takes place in the classroom or confined within the four walls, you can learn new things from anywhere and from anyone. In this inspirational ted talk for students, Jeffrey Cufaude talks about how life itself is a great teacher and we should not be narrow minded at any point of time, rather we should accept everything which comes our way and be opened to new experiences. A good student of life should not be afraid to face the unknown but should be adventurous. Watching this interesting ted talks will really make you see the brighter side of things and encourage you to have a positive outlook on things even on days when you are sad or glum. One of the hardest parts of college life is trying to balance things out so that you can do what you have come here to do, that is study and also have some fun and make some beautiful memories that you can keep in your heart till you are old and grey. One of the worst mistakes you can make as a college student is focusing all your attention on one aspect of your life, rather than enjoying a bit of everything. Never make the mistake of only focusing on your books, without making friends. Andy Pudducombre helps students to focus on the task at hand in this inspiring Ted talk. Many of you might think of skipping this Ted talk education after looking at or reading the seemingly pessimistic title, but this is one of the best Ted talks which you can watch as a college student as it is really hard hitting and give you real facts without sugar coating anything at all. As we all know life isn’t a bed of roses and so it is better that we are always prepared for whatever comes our way. In this best motivational ted talks, the experienced professor talks about most college students will fail to have a great career, but he goes on to tell them how they can prevent this from happening, they simply have to do what they are passionate about. It is commonly perceived that only those individuals who are out going and friendly are the ones who will be able to get ahead in life, though this is something which is true to some extent. Yet in this interesting and inspiring Ted talk, Susan Cain stresses on the importance of having introverts in the society and speaks about all that these socially awkward individuals are able to bring to the table. So if you are an introvert then be sure to watch his video as it is bound to help you feel good about yourself. Even if you are an extrovert watching his video will drive home the fact that you should not take introverts for granted. College students are those individuals who are trying their best to gain their own foothold especially because this is probably the first time when they are away from their home and their families. Bring away from home for the first time is something which is most certainly not an easy thing. In this inspiring and good ted talks, David Kelly talks about how you need not try to figure out what kind of person you are and what your talents are. He stresses on how we can all do whatever we want to do, provided we set our mind to it. He states that building your creative confidence while you are in college is something which you should be more concerned with. It is unfortunate but true that many of us have been bullied as children in elementary school and continue to be bullied in college as well. Trying to deal with this psychologically is certainly not an easy thing to do and has driven many people into a shell and scarred them for life. If you are someone who is a victim of bulling then it is advisable that you continue to hang in there and watching his video will really help you along the way and give you the courage to hold your own. In this Ted talk on grit, Shane Koyczan addresses this issue of bullying and even reads out a beautiful poem. Once we reach college, many of us think that it is time to grow up and act like adults, while taking responsibility for your actions and doing things as per a schedule is very good indeed and you should try your best to be a reliable individual, yet in this most inspirational Ted talk this young lady Adora Svitak, talks about no matter how old you are you should never be tough with your childish side and your childish curiosity. After all it is only children that dare to dream big and have no qualms about asking questions when they are plagued with doubt. It is very disheartening that in the society today, it is the women who are encouraged to act in a certain way such that they do not get raped , abused or do not attract negative attention to themselves. Yet in this ted inspirational talk, Jackson Katz talks about how it is the responsibility of the boys to ensure that social evils such as sexual abuse or domestic violence do not continue to plague the society. When men stand up and take matters into their own hands, then only this can be stopped. Such behavior by men, often cause a great deal of distress to all the members of the family and even end up scarring the children. These are few inspirational videos for college students. Children as well as college going students spend a great deal of their time online as well as on mobile phones, so rather than wasting your time uploading a meaningless selfie or aimlessly browsing through your newsfeed it is advisable that you watch these ted talks and really sock in whatever is being said. You need not incorporate everything which you have read into your life but you can try your best to improve yourself so that not only can you make your family members proud, but also become someone who you yourself are proud of.